Not only were Voß and von Richthofen friends, but von Richthofen considered Voß to be the only person who could possibly best him in a victory tally. The Red Baron had good reasons to think this way. 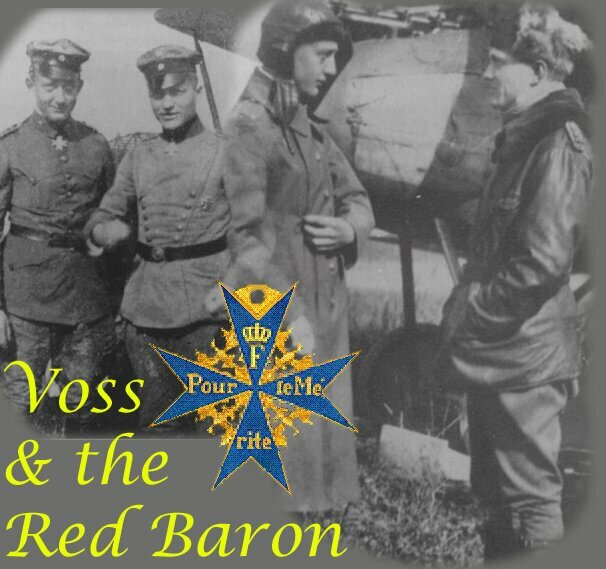 Voß was a natural when it came to flying and he possessed the same killer instinct that von Richthofen had. Both men were also keen competitors, which meant that von Richthofen did not consider Voß a threat to his record but instead he saw him as a worthy competitor. In fact von Richthofen so admired Voß' flying abilities that he pushed to get him transferred to Jagdgeschwader I.
" I flew over him again at ten meters altitude in order to determine whether or not I had killed him. What did the impertinent fellow do? He took his machine gun and shot up my whole machine. "Voß said to me afterwards, if that had been him we would have flown back and shot the fellow dead on the ground. This fellow was ,indeed, one of the few lucky ones who remained alive." At the time of his death, Voß was twelve victories short of von Richthofen's total. On that fateful evening, while low on fuel, he happened across two aircraft of No. 60 Squadron. von Richthofen was on hospital leave recovering from a gunshot wound to the head. Voß had surprise on his side, or so he thought and he attacked the two planes, driving them into the ground. If he would have been successful he would have raised his score to fifty. The last two aircraft would have been his second and third victory on that day. Unfortunately for Voß, No. 56 Squadron was flying top cover and Voß was jumped with little chance of escape.